Computed-Time termination automatic or manual equalize delayed-start option 5 year warranty. MCC solves the "perfect" charge problem by comparing the actual charge curve to an ideal charge curve, and adjusting the charge time accordingly. This method allows the MCC to compensate for differences in battery and charger size, for low finish rate chargers, for warm or cool batteries, for cell unbalance in older batteries, and for sags in ac line voltage that drop charger output during charge. Battery voltage during discharge varies with the load. Final voltage during charge declines with battery age. 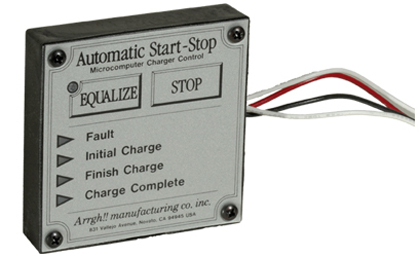 After charge or discharge, open-circuit voltage and specific gravity readings take hours to stabilize and be accurate. Other techniques, therefore must be used to determine the exact charge needed by the battery. Chargers with timer controls rely on guesswork. The operator has no way to calculate the exact charge time required. To ensure a fully charged battery, he or she usually overcharges it. ln fact, field studies indicate that chargers with timer controls, on average, overcharge their batteries by 18% to 32%. The secret to long battery life is a "perfect" charge, every time. The problem is how to provide it. Undercharge and overcharge ruin batteries. Undercharge allows lead sulfate crystals to form in the battery's plates. These crystals reduce battery capacity and break the plate grids and sleeves. Overcharge causes heavy gassing and high temperature. Heavy gassing dislodges active material from the battery's plates, eventually shorting out the cells. Heavy gassing also requires frequent water addition. And if the battery's temperature rises above 115 deg. F (46 deg. C), additional damage may be done to the plates and separators. How much charge does your battery actually need? That depends on ampere hours discharged, temperature & condition of the battery, initial & finish charge rates of the charger, condition of the connector contacts, and variations in ac line voltage during charge. Several of these factors change daily, especially ampere hours discharged. The "charge need" of your battery, therefore, changes every day!